Hi everyone! 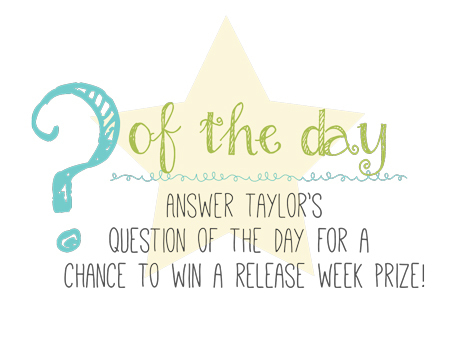 It’s the first day of Taylored Expressions‘ September 7 release previews! It’s also TE’s NINTH birthday, so there’s a lot of partying going on. Be sure to read to the end and also check out all party details on the TE Blog. 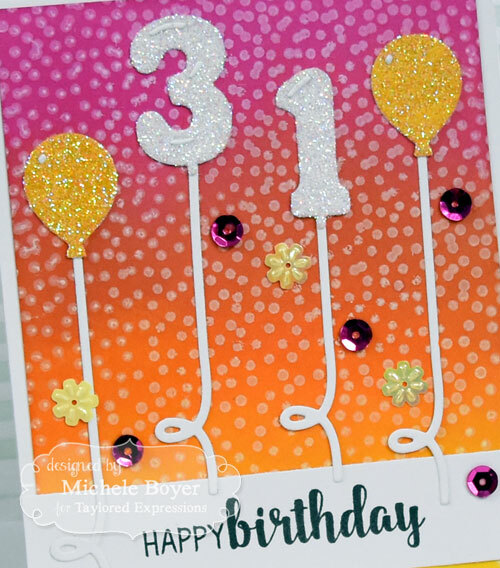 My first card today features new Simply Said Birthday, Free Fall Background, Number Balloons and Balloon Strings dies. 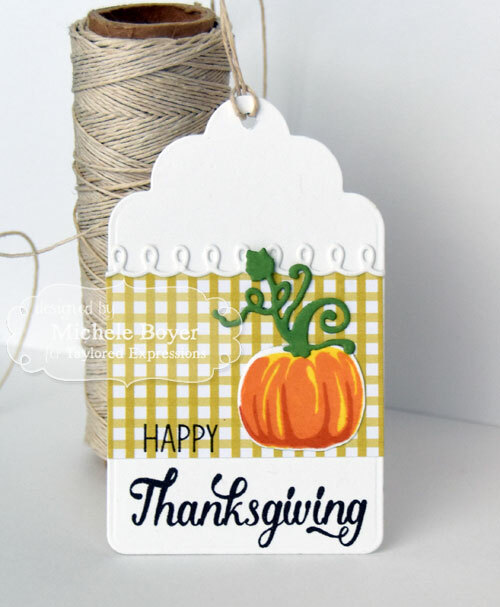 I first sponged my background using Lemon Meringue, Candy Corn and Lollipop inks. Then I used Sugar Cube pigment ink to stamp Free Fall Background. 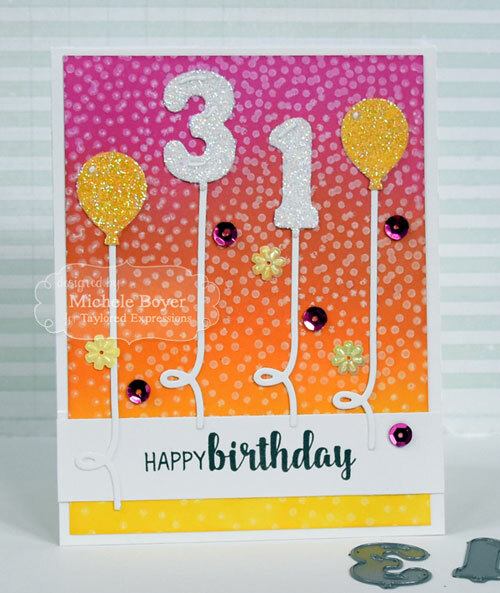 To create the super sparkly balloons, I adhered Sugar Cube and Lemon Meringue card stock to an X-Press It Double-sided Adhesive Sheet. Laying the dies on the adhesive side, I die-cut the numbers, removed the release sheet to reveal the super sticky adhesive, then dumped glitter over top. I pressed a bit with my fingers to ensure the pieces were covered with glitter then tapped off the excess. 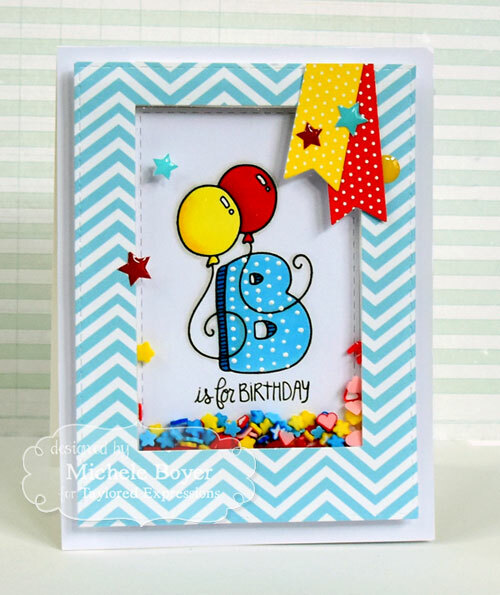 Next, I created a fun shaker birthday card using new B is for Birthday. I stamped the image onto white card stock then colored with Copic markers and added dots using Copic’s Opaque White. I double-stacked a border of foam tape and sprinkled inside some Queen & Company Fimo Fun and Sprinkles toppings. After adhering the acetate cover, I adhered a frame cut from Rainbow Brights patterned paper then added a couple flags and Enamel Shapes. Hi everyone! 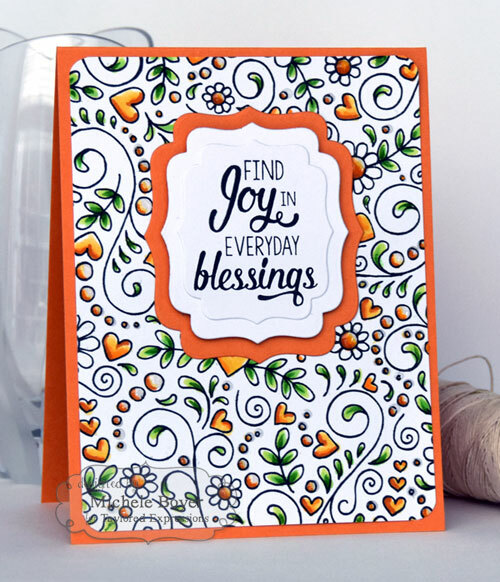 I’m popping in today with a card I created using my Copic airbrush/compressor, Sketch markers and Colorless Blender. Using a combination of the three, I created and background and image, using ink to only stamp the butterfly bodies and sentiment. I first airbrushed Y17, Y13 and YR04 onto a block of glossy card stock. I let that dry while I ran several errands. Once the ink was dry, I placed a rubber butterfly stamp (from Taylored Expressions’ Simply Stamped Butterflies) onto an acrylic block. I spritzed the stamp with Colorless Blender then carefully stamped the butterflies onto the airbrushed card stock. Upon contact, the Colorless Blender pushes away the ink, leaving the impression of the butterfly. Pretty cool! Once the butterflies were dry, I removed the sprayer/straw from my mini spritzer containing the Colorless Blender and flicked some drops of Colorless Blender over the butterflies. Then once that was dry, I stamped the butterfly bodies and sentiment (from Paper Smooches Many Thanks). 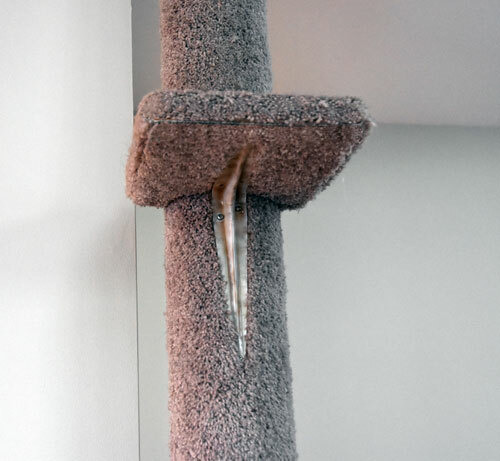 On a totally different creative note…my husband built a very tall cat post with three shelves using on empty (heavy-duty) carpet roll, carpet and wood blocks for shelves. Beneath the shelves he had used bright white brackets. They stood out like a sore thumb but I used my airbrush to spray the brackets so they’d blend in a bit more with the surrounding carpet. The post isn’t the prettiest item in my house but it’s in an inconspicuous spot. I love my two cats and they like the post and shelves. (If they only loved each other…) Anyway, the airbrush came in quite handy. At only 9.9 pounds, the air compressor is lightweight, runs quietly and is very portable. It’s perfect for airbrushing with Sketch or Classic Copic markers and takes up very little space. On the Copic website are several airbrush options as well as airbrush supplies and more detailed information. 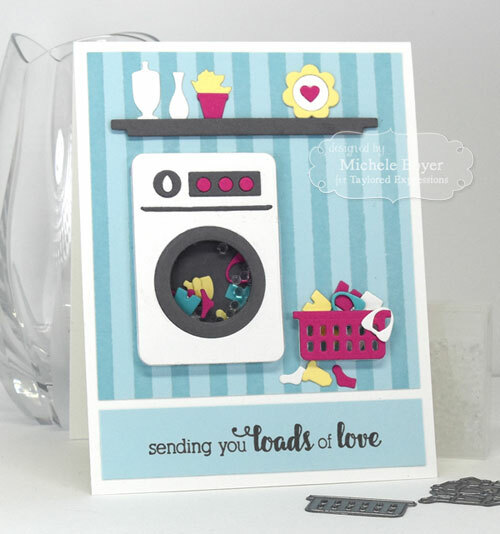 Today I’ve used Taylored Expressions‘ Spin Cycle shaker die with Spin Cycle Sentiments. In the washer I placed some Little Bits Clothing Confetti along with some clear Tiny Bubbles from Queen & Company. The clothing is in (and around) a Little Bits Laundry Basket, and above the washer I added some elements from Sitting Pretty and Sitting Pretty Accessories. Hi everyone! 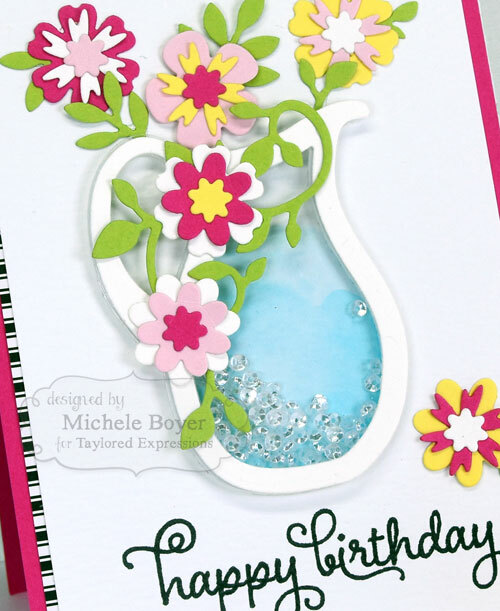 Today I have a fun shaker card to share using stamps and dies from Taylored Expressions with pretty toppings from Queen & Company. 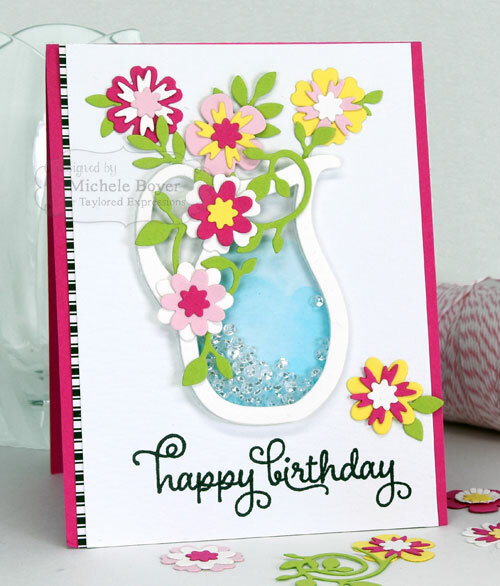 TE’s Pitcher Vase dies are designed for easy creating of shaker cards. I simply taped the two dies together with an even border around all edges to create the vase frame. While the dies were still taped, I also cut the frame shape from an adhesive sheet to create the foam border. The inside of the shaker was watercolored with distress ink then Queen & Company super sparkly diamond toppings were placed inside. I used Mini Bloomers and Bloomers Greenery dies to create the flowers and added a sentiment from Shade Tree Sentiments. Hi everyone! I hope you’ve enjoyed the Taylored Expressions‘ August release previews over the last several days. 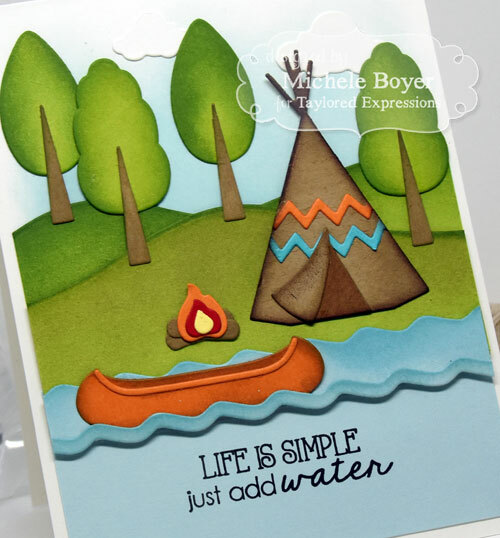 All new stamps and dies are now available in the TE store. Before you head over, I have two more samples to share. 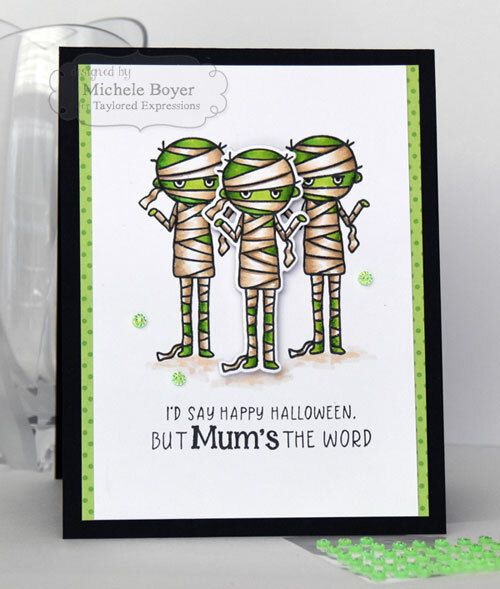 The left and right mummies were stamped directly onto the paper while the center one was stamped separately, die-cut and popped up on foam tape. Lastly, I used the owl from Peek-a-Boo Halloween and new Little Bits Ornate Frame. After doing a bit of light sponging with Candy Corn ink, I die-cut a Chocolate Truffle branch (from On a Limb – Branches). I punched two holes from the frame center then colored in eyeball shapes after adhering and tieing the frame to the branch. 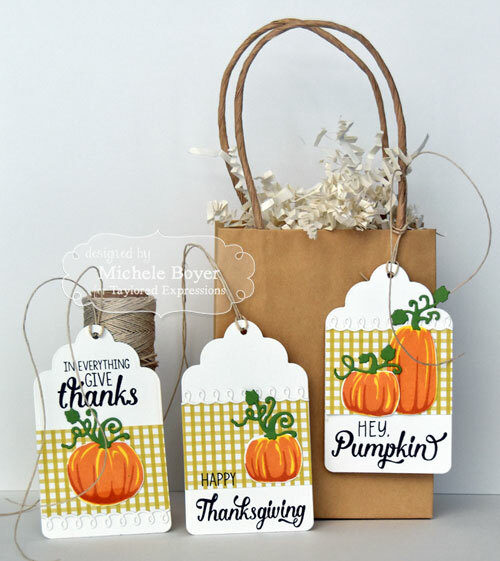 First I have a trio of tags using new Simply Stamped Pumpkins with Simply Stamped Pumpkins dies. 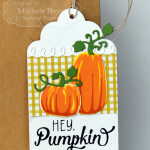 The set includes a variety of sentiments that work with Thanksgiving or Halloween, with pumpkin faces or without. The pumpkins were stamped in three different steps, first in Lemon Meringue, then Candy Corn and finally Pumpkin ink. My MISTI came in very handy, allowing for easy alignment of the layers. The small photos above can be seen in a larger format by clicking on each. 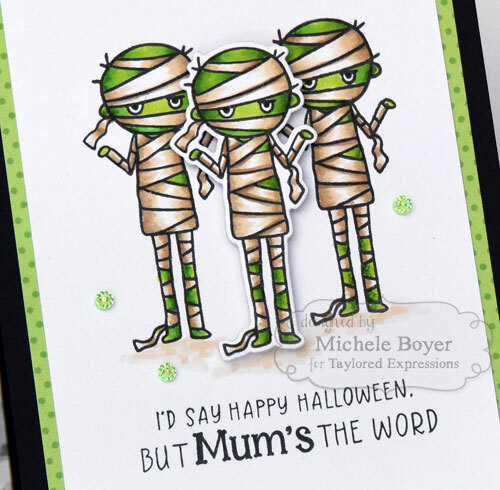 My second card uses new From the Crypt – Creepy die, Label Stacklets 11 and a sentiment from Peek-a-Boo Halloween. I used the corresponding sized die from Label Stacklets 11 to die-cut the Granny Smith background, then simply adhered an additional Oreo Creepy die-cut on the right. The sentiment was stamped in Sugar Cube pigment ink then white embossed. 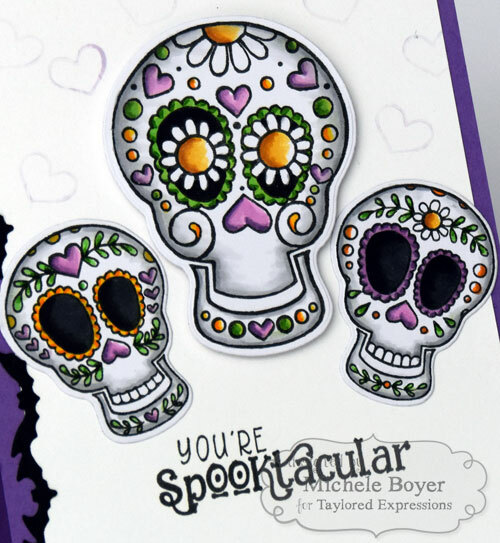 Taylored Expressions August Previews Day 2 – Skulls, Candles and Cats, Oh My! Hi everyone! 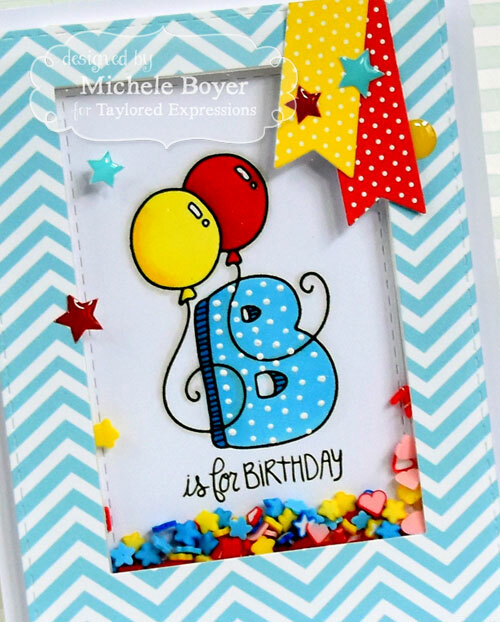 I’m back today to share two more samples of Taylored Expressions‘ upcoming August 3rd release. 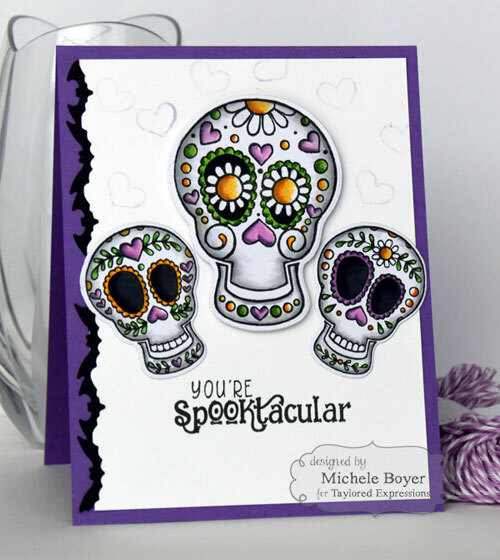 My first card uses new Sugar Skulls (with coordinating dies) as well as Simply Said Halloween and Skinny Mini Halloween Borders. These skulls crack me up. They’re kind of spooky and funny at the same time. 🙂 Along with the set comes a swirl, flower and the heart I lightly stamped in the background. The skulls were colored with markers, die-cut and adhered with the center skull raised on foam tape. The sentiment is from new Simply Said Halloween, and along the left, I adhered a border of new Skinny Mini bats. Next, I used new Little Bits Candelabra and Cat to decorate a fireplace (die-cut using By the Fireside). 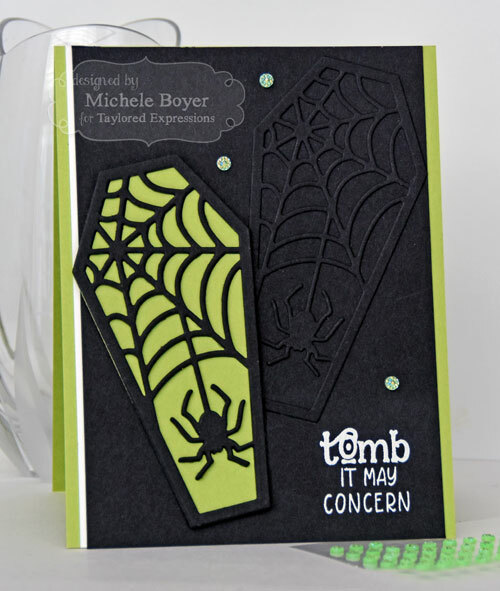 I added a Little Bits Spider & Web, with a sentiment from new Mum’s the Word stamp set. The tiny frame hanger was cut using an element from Sitting Pretty. 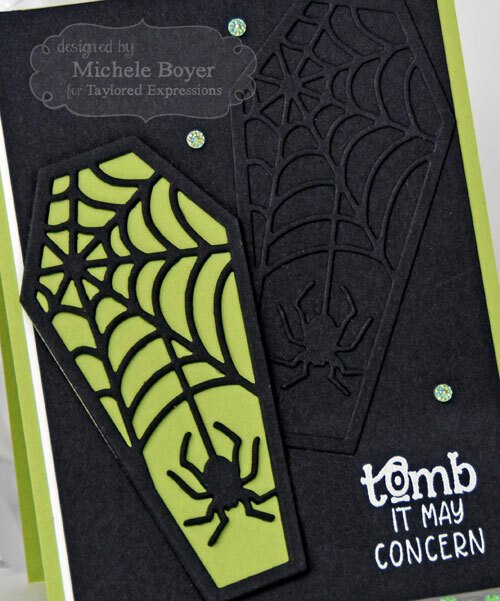 The patterned paper background is from Build a Scene Halloween paper pack. I thought it worked perfectly as (Halloween) wallpaper. I’ll be back tomorrow with more previews! Hope to see you then! 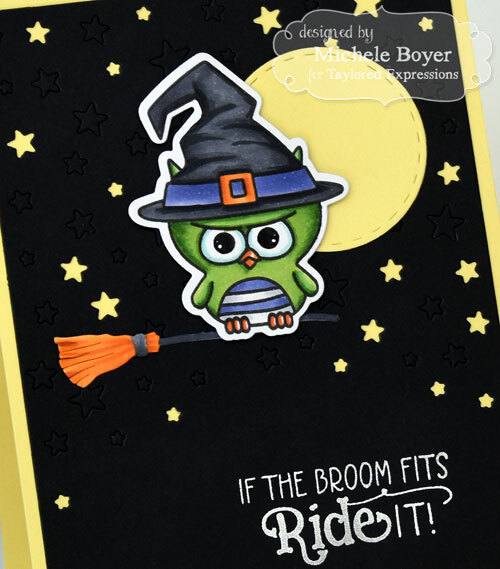 Welcome to Day 1 of Taylored Expressions‘ August 3 release previews! 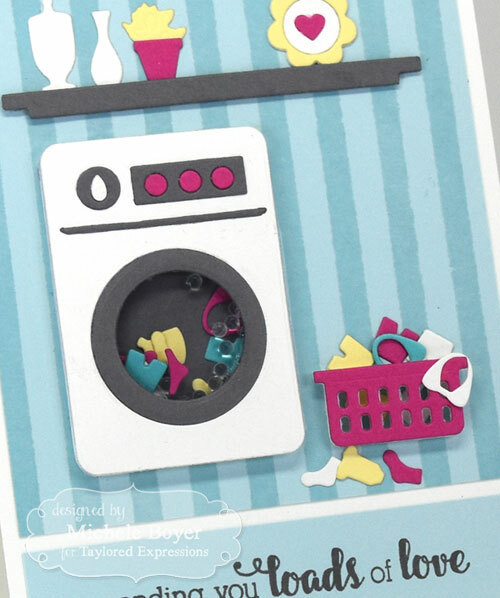 I had so much fun with this month’s new stamps and dies. Be sure to check out the rest of the team’s previews too! 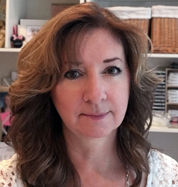 You can find links on the TE blog today. 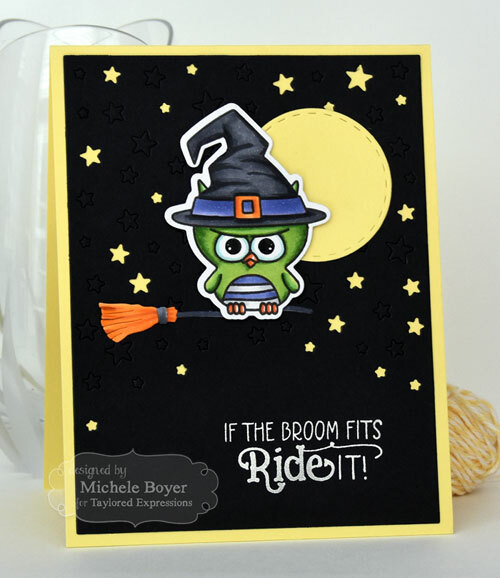 She was stamped in Oreo ink, colored with markers and die-cut, then placed atop a Little Bits Broom. I die-cut Oreo card stock using Starry Night Cutting Plate, leaving some of the stars in place with some removed to show the Potato Chip card stock from beneath. Next, I used lovely new Happy Flowers Background. 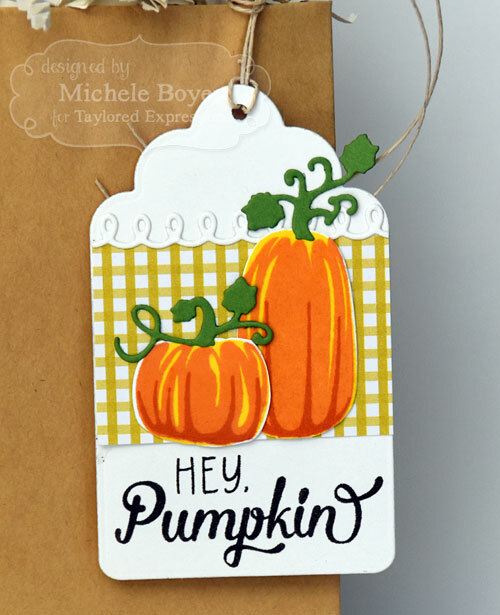 I paired it with a sentiment from another new set, Simply Stamped Pumpkins. 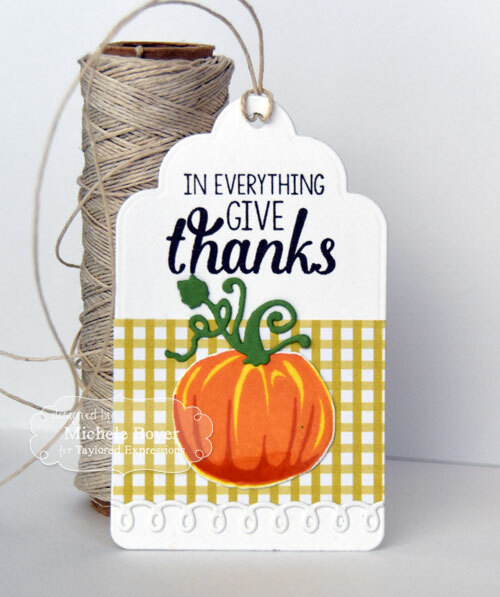 The sentiment was stamped and layered onto Label Stacklets 2 with foam tape tucked beneath the bottom layer for a bit of added dimension. After coloring with markers, I added Glossy Accents over the dots and flower centers. Taylored Expressions is bidding a fond farewell to over 120 products as we retire some of our favorite items with an amazing SALE. Choose from a variety of stamps and dies at prices up to 85% off — but hurry, once they’re gone, they’re gone forever! Visit the SALE HERE to start shopping! Below are a couple cards I created a while back using two of the retiring sets. Hi everyone. I hope you’re enjoying the summer weather. While it is not as hot here as in Arizona (thankfully), we make up for it in humidity. Y-U-C-K. 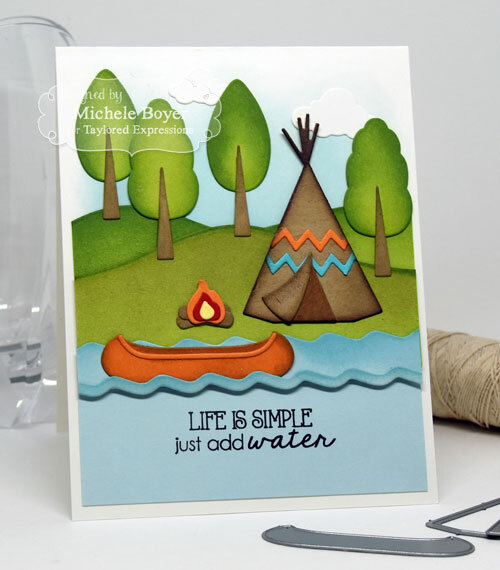 I used Lakeside with Lakeside Border, Rolling Hills and clouds from Little Bits Sun & Clouds. Before adhering the hills and trees, I lightly sponged Salt Water Taffy ink to create a sky. Thanks so much for visiting day!